Why has the continued crisis of dispossession not been treated as a national emergency? Given the scale of the foreclosure crisis, the policy response has been muted. 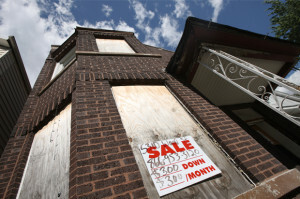 Congress and the Obama administration have repeatedly rejected demands for a national moratorium on mortgage foreclosures. Legislators in several states introduced foreclosure moratorium bills, but few states enacted them, and those only briefly, in response to evidence of forged documents and other egregious fraud by lenders. Calls for “cramdown” legislation that would have allowed bankruptcy judges to reduce mortgage loan principal went nowhere. The federal government created several programs to respond to the crisis, including the Neighborhood Stabilization Program, the Home Affordable Modification Program, the Home Affordable Refinance Program, the Home Affordable Foreclosure Alternatives program, the Home Affordable Unemployment Program, and the Emergency Homeowners Loan Program. Many of these programs were commendable, but few of them were effective, and from the standpoint of the dispossessed they were too little, too late. None of them had much effect on the pace of foreclosures. Nor did any of them direct much aid to people who had already been dispossessed. This is not how we would treat the crisis if it were recognized as the ongoing emergency that it is. One reason that we have not done enough may be the sheer scale of the problem. It would take an enormous effort to solve such an enormous crisis. The point is illustrated by one government effort, the so-called National Mortgage Settlement, which did provide aid to the dispossessed. In 2012, the federal Department of Justice and the attorneys general of every state, except Oklahoma, concluded an investigation into illegal mortgage lending practices by signing a settlement agreement with five of the largest mortgage servicing companies. The settlement required the five companies to provide an estimated $25 billion in debt forgiveness and other forms of relief. That sounds like a big number, and state and federal governments have described it as one of the largest consumer protection settlements in history. But much of the “relief” counted toward this total consists of profitable loans that these lenders might have extended anyway, and very little of this settlement consisted of aid to the dispossessed. Only $1.5 billion of the total settlement was earmarked for payments to borrowers who lost their homes to foreclosure in the years 2008 to 2011. Those onetime payments were slow in coming. The first batch of checks sent out to foreclosed borrowers bounced. The second batch of checks, intended to remedy this error, only added insult to injury—they were made out incorrectly for amounts substantially less than the eligible borrowers were owed. When the correct checks finally arrived, they were made out for approximately $1,480 each. In most of the United States, that is less than two months’ payment on the average residential mortgage. The National Mortgage Settlement was big, but it was not nearly big enough to repair the damage that the crisis did to the lives of the dispossessed. Another reason why the government has not done more to help the dispossessed may be their invisibility. According to the National Suburban Poll, most Americans say they do not know anyone who lost a home in the foreclosure crisis. Most of the dispossessed were not displaced very far, and the most visible manifestations of the crisis, from vacant homes to increased tension among neighbors, have been concentrated in neighborhoods where the majority of Americans do not live. The result of this invisibility is that people, including our elected officials, may have an inaccurate and stereotypical picture of the dispossessed as distant strangers. If they think of the suffering of the dispossessed at all, they are likely to think of it as an abstraction rather than as the real fate of someone they know and with whom they sympathize personally. Yet another reason why the government has not done more is surely the political influence of the financial industry. The big mortgage lending firms spend a lot of money on lobbying and on donations to political campaigns. So do their employees, who comprise a disproportionate share of all high-income voters. Political scientists have shown that Congress is especially responsive to the preferences of rich people, in part because rich people contribute the most money to elections and interest groups. Case studies of lobbying by the financial industry suggest that the more contributions a legislator has received from this industry, the more he or she is likely to vote against regulatory protections for mortgaged homeowners. Wall Street really does have a lot of sway in Washington. Perhaps the most important reason why our government has not done more to help the dispossessed, however, is that the people displaced by the foreclosure crisis do not yet command a political voice commensurate with their numbers. Even though the scale of the problem is enormous, even though the dispossessed are invisible, even though big money is arrayed on the side of the mortgage lending industry, you still might expect the dispossessed to have some political clout of their own. After all, ten million displaced adults is potentially a big constituency. (For a point of comparison, it is greater than the total number of Americans who voted for all of the victorious Tea Party candidates for Congress in 2010.) A voting bloc of this size might be expected to have some influence. The problem is that the dispossessed, despite their numbers, are not a voting bloc. Compared to other American adults, they are disenfranchised and disillusioned. Both their disenfranchisement and their disillusionment reflect badly on the quality of American democracy. To say that many of the displaced are “disenfranchised” may sound overly dramatic, but we mean it literally. Foreclosure uproots people from the places where they live. It thereby uproots them from our place-based civic institutions, including the institution of the franchise. In the United States, unlike many other democracies, voter registration is tied to a residential address. This means that mobile voters face barriers to participation. If you move, you typically must familiarize yourself with registration requirements in your new state of residence, apply for a new government-issued identification that certifies your new address, and then reregister to vote. In most states, the process takes weeks, and even in the best circumstances this process makes it inconvenient for a highly mobile adult to remain registered to vote. Even if you don’t move across state lines, even if the requirements in your state are not especially onerous, these requirements still make it difficult to stay registered. It should come as no surprise, therefore, that displaced individuals often do not remain registered to vote. [This is] what this means in the context of the foreclosure crisis: according to the National Suburban Poll, dispossessed respondents are less likely than others to say they are registered to vote (62%, compared to 77% of respondents who did not lose a home). Displacement can also make it harder for you to vote even after you register at your new address, because having a stable residential address is important for creating the kind of personal connection that can help get you to the polls. Experiments have shown that we are most likely to vote when someone asks us in person. Party and candidate organizations know that face-to-face contact matters for voter turnout, and they rely on databases of frequent voters organized by address to identify likely voters and bring them to their polling places. People who have moved recently— even if they did not move far—are unlikely to show up on these lists. People who do not show up on these lists, in turn, may not be contacted by candidates, engaged in discussions of the issues, or offered help to get to their polling places. Unsurprisingly, then, social scientists have found that zip codes with especially high foreclosure rates had lower rates of voter turnout in 2008.4 Our survey data … confirm that individuals who lost a home to foreclosure are much less likely than others to say that they always vote (26%, compared to 54% of respondents who did not lose a home). Dispossessed adults are also much less likely than others to say that they voted in the 2008 election (57% said they voted, compared to 73% of those who did not lose a home). Are these people disenfranchised because they are displaced? We do not know whether these particular survey respondents were any more likely to participate before the foreclosure crisis struck their households. We do know that people in displaced households are underrepresented at the polls partly because they are disproportionately young, single, low income, and people of color—all groups that are underrepresented among regular voters even when they have not lost their homes to foreclosure. When we adjusted the probabilities of political engagement to account for differences of age, race, gender, marital status, parenthood, income, education, and church attendance, we found that the low rates of political participation among the dispossessed are about what we would expect given the social and demographic profile of the group. In other words, we found no evidence that displaced respondents were any less likely to be registered voters, to be regular voters, or to have voted in 2008 than we would expect in any random sample of Americans with a similar mix of young people, singles, low-income people, and people of color. Of course, it is possible that young people, singles, low-income people, and people of color are all underrepresented in the electorate partly because they move a lot even at the best of times. And when we compared the dispossessed to people who were at risk of foreclosure—homeowners of working age—we found that dispossessed respondents were indeed substantially less likely to be registered, to vote always, or to have voted in 2008. We call this pattern “disenfranchisement” rather than disengagement, because we think it reflects the exclusionary structure of our place-based political system rather than a personality trait of the dispossessed individuals. We examined the survey data for evidence that dispossessed respondents were withdrawn, apathetic, or disengaged in general, and we found none. They are just as likely as other respondents to say they attend church weekly, for example, as Figure 12 illustrates. It is only when it comes to politics that they are participating less than other people. The displaced are less likely than others to participate in politics, but would it really make any difference if they participated more? One way to answer this question is to look at the policy opinions that they express in survey interviews. At first glance, these respondents do not seem to have a particularly distinctive point of view on public policy issues. They are a diverse group, with a diversity of opinion. … In our statistical tests, we found no difference between the opinions of respondents in displaced households and the opinions of anyone else in response to these questions. When we surveyed respondents in displaced households about specific policy issues ranging from extending emergency unemployment benefits, to cutting federal spending on Medicare or defense, to raising taxes on the rich, to investing federal dollars in so-called green-collar jobs, their views turned out to be a lot like the views of everyone else— which is to say, they are all over the place. The reason that respondents in displaced households do not have particularly distinctive views on these questions, however, may be simply that like most other American adults, they do not have any firmly held views on policy matters this specific. It is a commonplace of public opinion research that almost no one in a representative sample of American adults has much knowledge about such a wide range of public policies, or has thought in much detail or with much specificity about policy questions like these. When people are asked about particular public policies that they have not thought about in detail, they may express “nonattitudes,” or repeat something they have heard recently that sounded plausible to them.6 That does not mean that they are stupid. It just means that they are not as interested in political issues as public opinion researchers are. Most people, maybe especially people who are putting their lives back together after a foreclosure, have other things to think about. When it comes to articulating a more general perspective on politics, however, most Americans know more or less where they stand. And when it comes to articulating just such a general perspective on politics, we find that respondents in displaced households—including dispossessed respondents and those they rely on most directly for housing—do indeed have a distinctive point of view. That point of view is neither exactly liberal nor exactly conservative. We can characterize it instead as “disillusioned.” The people who are sharing households with the dispossessed think government should do more to reduce economic inequalities, but they do not think that it will. In general, respondents in displaced households think government should do more to reduce inequality. Fully 67 percent of respondents from displaced households agree with the statement, “The government should work to substantially reduce the income gap between rich and poor,” and 44 percent agree strongly. Among respondents who do not know anyone who lost a home in the foreclosure crisis, the comparable numbers are 56 percent and 35 percent, respectively. A majority of all Americans say they want their government to do more to reduce inequality, but that majority is especially strong and emphatic among the most socioeconomically vulnerable Americans, who are also the Americans who felt the consequences of the mortgage foreclosure crisis most directly. When asked whether they have confidence in government, however, respondents in displaced households are more skeptical than the average American. Our survey asked directly about their confidence in the federal government; … 54 percent of respondents from displaced households say they have “no confidence at all” or “not too much.” Among respondents who were not personally exposed to the foreclosure crisis, only 46 percent give those answers. The survey also included questions about how much confidence respondents had in state government, local government, and public schools. Responses to each of these questions comprise a 4-point scale from “no confidence at all” to “a lot of confidence,” and we added these scales together to form a 13-point scale of confidence in government in general. Respondents in displaced households score about one point lower on this scale than respondents in the distant majority. Respondents in displaced households express less confidence in government even than other respondents who were otherwise comparable with respect to age, race, gender, marital status, parenthood, education, income, and church attendance. When we computed a statistical adjustment for these factors, we found that respondents in displaced households still have less confidence by almost one point on the scale. Their skepticism of government is not the same as a conservative hostility to “big government” or an embrace of unregulated markets. Respondents from displaced households are no more likely than anyone else to identify themselves as conservatives, and they do not express especially conservative views when asked directly about economic issues such as tax cuts, Medicare, or federal spending on an environmental jobs program. As we interpret their responses, the typical person in a displaced household wants the government to do more to reduce inequality, but does not have any special insight into what policies would best achieve this goal and does not have confidence that government will do the right thing in any case. We think that point of view is understandable. Certainly nothing in their experience of the foreclosure crisis would give them confidence that anyone in government has the political will to reduce inequality. In other words, the people who have experienced the foreclosure crisis most directly are the most disillusioned with government. The survey data here do not tell us whether they have become more disillusioned because someone in their household was displaced, or whether this crisis displaced people who were disillusioned to begin with. What the survey does tell us is that respondents in displaced households have some distinctive beliefs. T hey are more likely than other people to favor government intervention to reduce inequality. They just don’t think government will listen to them. Excerpted from “Foreclosed America” by Isaac William Martin and Christopher Niedt.